I’m still on tour! Click here for details! And now, here’s the second of six character illustrations by Jennie Gyllblad for my latest book, Zeroes. 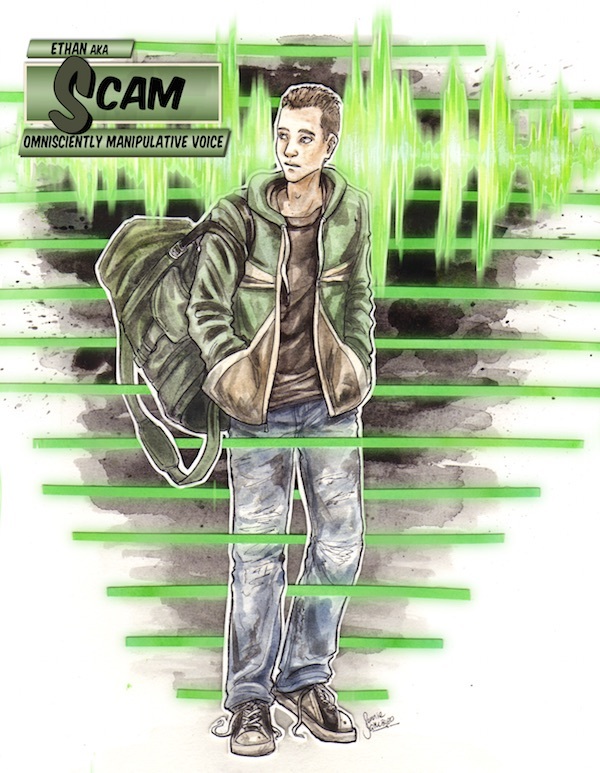 Scam isn’t very good at speaking for himself, because he’s always had the voice to speak for him. He just opens his mouth, and it starts talking, saying whatever it needs to get Scam what he wants. Alas, it doesn’t think very far ahead. The guy walked with a steady purpose. He had an army-green duffel bag over one shoulder. Ethan let himself drift into his way until the bag slapped against him. ”Hey, watch it!” he said in his own voice. The guy spun to face him. He was a few inches shorter than Ethan, but twice as big across the shoulders. And he had no neck. The sort of guy who could crush you with an annoyed glare. His right hand dropped into a jacket pocket, like he was ready to pull a knife. The guy scanned Ethan. His eyes were piercing, way too blue. Almost electric. But a moment later he smiled, eased his hand out of his pocket and gripped Ethan’s shoulder. It was like being held up by a wall. That was one of the voice’s specialties. Names. The big guy paused, looking him up and down. Not smiling anymore. Ethan hated when this happened. The voice would get him into situations that only the voice could get him out of. Then he was stuck, listening and waiting. Letting it talk. ”Taylor said you were bad off last night. Wasn’t sure you’d remember the way to his house.” The voice sounded like it was making a joke, so Ethan tried to smile. ”My sister’s in his old army unit,” Ethan heard himself say, and cringed. Thing was, his sister really was in the army. Stuff could go really wrong when the voice told the truth. What if the guy asked for his sister’s name? What would the voice say then? A low thunder of laughter spilled out of The Craig, who reached over and took Ethan’s shoulder again. The weight of his hand almost buckled Ethan’s knees. The Craig headed for a side street. Ethan took a breath and followed. Hell, maybe he could still get a ride home out of this. Click here for more about Zeroes. It’s out in Australia and the UK, and comes out Tuesday, Sep 29 in the US. Below is the first of six character illustrations for my new book Zeroes, written with Margo Lanagan and Deb Biancotti. The image is by Jennie Gyllblad. Flicker can’t see through her own eyes, but she can borrow those of anyone around her. in other words, in a room alone she can’t see. In a room with a few other people, she can see quite a lot. And in a huge crowd, she’s almost omniscient. All the Zeroes’ powers work this way: the more people around, the stronger they are. Crowd-sourced superpowers! Flicker was in the concierge’s eyes. His long fingers were scrolling a touchpad screen, his gaze flitting across requests from customers arriving in the next week. The hotel was filling up, thanks to the big Fourth of July display. Everyone wanted a room with a view of the old Parker-Meridian Hotel, which was scheduled for demolition during the show. Every minute or so the concierge looked up, scanning the lobby in a discreet and professional way. Perfect for keeping watch. Flicker saw herself in her wingback chair, her bright red dress easy to spot. But as she gave herself a smile, the concierge’s gaze slipped past her and came to a rest on a huge man strolling across the lobby floor. The concierge stared. It was hard not to. The guy was as wide as a door, all shoulders and thighs. He wore a shiny black t-shirt made from enough silk for a parachute. Five other big guys cruised across the lobby floor with him, a formation of battleships. A man in a Magnifique staff uniform came up and started talking to them, and the concierge’s eyes dropped back to his computer screen. Flicker sent her vision into the big guy’s eyes. She couldn’t hear anything from across the lobby, but it didn’t seem like a confrontation. The two were huddled close, the big guy’s eyes moving warily from side to side. The hotel staffer, a short man with a shaved head, held out his empty palm, and the big guy pushed a stack of twenties into it. In return, the staffer produced a hotel keycard and slipped it into the breast pocket of the big guy’s shirt. This was getting interesting. 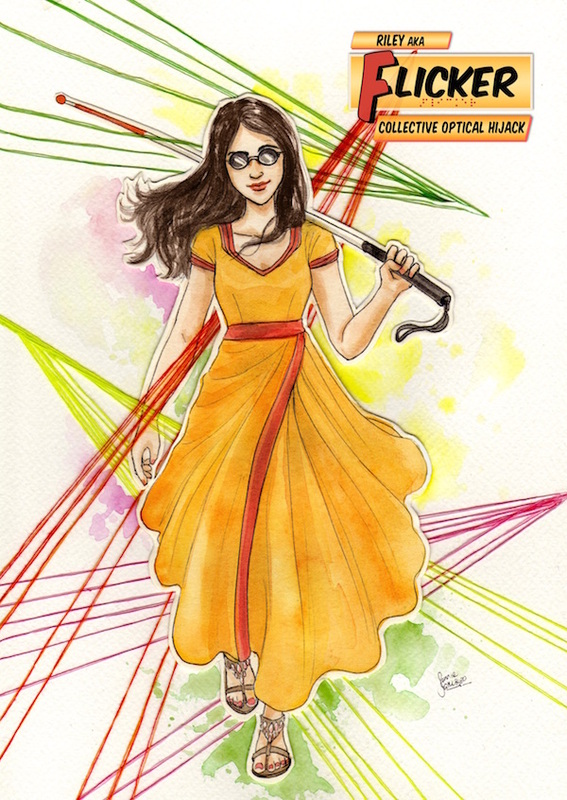 Flicker unfolded her cane and stood. 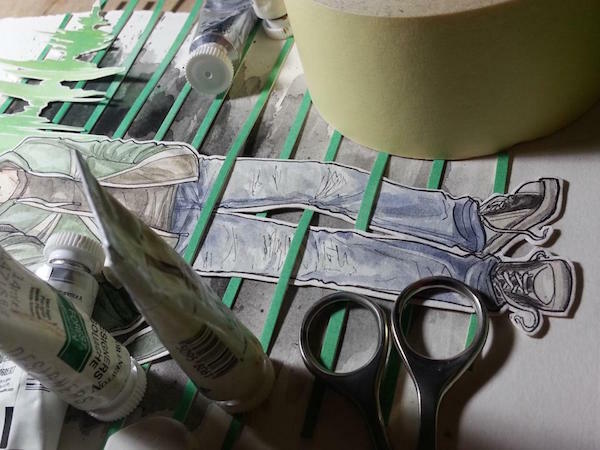 What I like most about Jennie’s work is that it combines illustration with collage. As you can see here, Flicker’s background is created with yarn and watercolor. 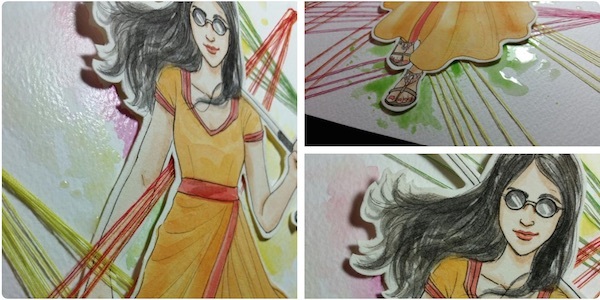 So the characters are sort of like superpowered paper dolls. Tune in over the next couple of weeks to see the rest of the characters. Click here for more about Zeroes. It’s out now in Australia and the UK, and on Tuesday, Sep 29 in the US. UPDATE: My SDCC panel has already happened, but I’ll also signing on Saturday! There will be free Zeroes samplers and many of my books for sale! 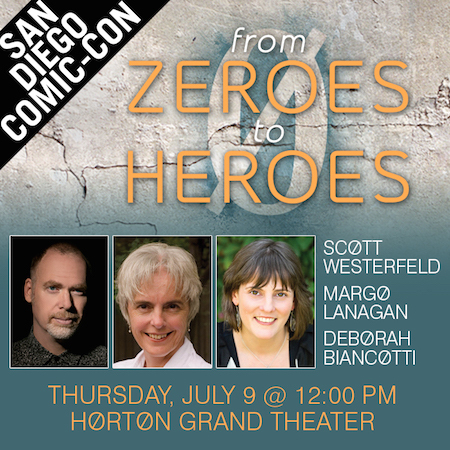 I’ll be talking about my next novel, ZEROES, at San Diego Comic Con next week, in company with my co-authors, Deb Biancotti and Margo Lanagan. We have our own panel to discuss the book! Also I’ll be signing after the panel, 1:30-2:30, at the San Diego Convention Center Autographing Area, AA09. And Mysterious Galaxy will be on hand to sell copies of my books! Please share this graphic with ALL YOUR SDCC-GOING FRIENDS! 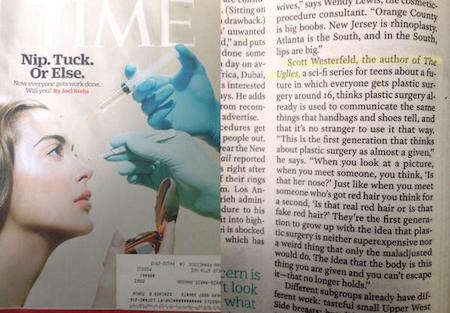 Time Magazine has a cover story about ubiquitous plastic surgery this week, and I am quoted in my capacity as Author of Uglies and Fake Expert on Body Image Stuff. 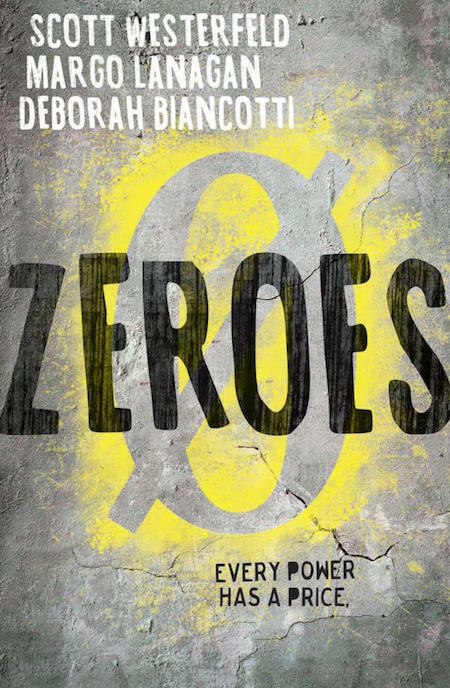 At Book Expo America, I spoke with Jessica Mazo about Zeroes, my next novel, cowritten with Deb Biancotti and Margo Lanagan. Readers of the Uglies series may remember Aya’s pal Moggle in Extras, a semi-intelligent hovercam that tracks her around, providing footage of her exploits for her feed. It seems that someone has invented something similar, but called it Lily. Here’s the camera’s official site, and you can find tons of other articles around the web. It’s not quite Moggle, but it’s proof of concept. And why wouldn’t we all want our own hovercam following us around? BONUS: My latest novel, Afterworlds, is only $1.99 in the Kindle store this month. Click here to check it out. A quick reminder: Justine and I will be at Oblong Books in Rhinebeck, NY this Sunday! (May 10, 4PM) Click here for more details. 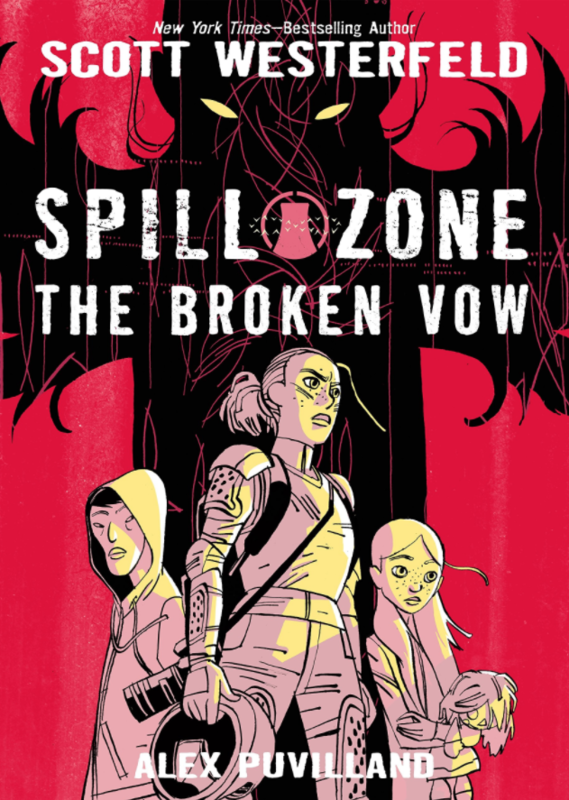 And now, here’s the Australian version of the Zeroes cover! The UK cover will be revealed soon! I’m doing three events in May: an appearance at Oblong Books in Rhinebeck, NY; several panels and a signing at the Romantic Times Conference in Dallas, TX; and a few things around Book Expo America here in New York City. Justine and I will be talking about our new books, Razorhurst and Afterworlds, and of course signing whatever you want us to sign. Here’s a link to the event. Also, I’ll be at the huge Book Fair signing on May 16. Several of my books will be available for sale there. Note that you have to get admission to the RT Convention to attend an of these events. And finally, I’ll be at several events around Book Expo America and Book Con here in NYC.